THIS PRODUCT IS REGISTERED AS A FOOD SUPPLEMENT. IT IS NOT A MEDICINE AND SHOULD NOT BE USED AS A SUBSTITUTE FOR PRESCRIBED MEDICINES. 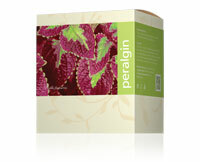 Peralgin is a bio-information product containing oils and extracts from medicinal herbs and exotic fungi. It harmonizes primarily the controlling channel and the channel of lungs, and also channels of urinary bladder, neural and hormonal systems, spleen and pancreas. Due to its exceptional composition this product strengthens and harmonizes natural immunity, acts on all allergic manifestations, and helps prevent attacks of allergy. It suppresses asthmatic cough and is effective against hay fever, itching of mucous membranes, and reddening of the skin. It helps relieve such allergic skin conditions as nettle rash or atopic eczema. It is very effective also in the cases of migrainous headaches and hot flushes in the period of menopause. Peralgin is a tonifying product that can be used for the overall replenishment of body energy. in cases of food allergy or food poisoning; when suffering from excessive sweating and hot flushes; to calm the neural system (in cases of fatigue, stress, agitation, etc. ); when suffering from lack of energy; in cases of premenstrual syndrome and painful period; in cases of stomach and heart neurosis; when suffering from motion sickness; and against muscle spasms. This plant has antioxidant and anti-inflammatory effects. Scientists proved its effect in the treatment of allergic symptoms. It replenishes vitality and tonifies the body, increases energy and acts as a natural aphrodisiac. It has a protective effect on lungs. It promotes blood circulation and detoxifies the whole body. It activates enzymatic and hormonal system and regulates the functioning of internal organs. It shows quite strong anti-inflammatory and anti-allergic effects (works well against fits). It calms the feeling of nervousness caused by stress, relieves spasms, and alleviates pain. It has a positive effect in the treatment of atopic eczema, allergies, psoriasis, and acne. It helps treat upper respiratory infections. It shows a positive influence on the hormonal system and relieves the symptoms of menopause. It strengthens the organism and improves the stress resistance. Grape seed extract has antioxidant effect, lowers the risk of cardiovascular diseases and promotes blood flow. It stimulates collagen synthesis, and thus reduces the appearance of wrinkles. It calms down neural system, alleviates pains and relieves spasms. It is effective in cases of insomnia, neural fatigue, meteorism and nausea. Bio-information is a frequency emulating the controlling frequencies of the brain subcortical centers that control vegetative nervous system and the functioning of internal organs. Through their activity, the negative information is blocked, and the process of reverse regeneration is started. Recommended daily dose: 1-3 capsules per day. Peralgin can be used either for prophylaxis, or for acute conditions. The product is not designed for children, pregnant and nursing women. The product is not recommended to people hypersensitive to bees’ and soybean products.